[Blind Gossip] Lots of guys with beards lately, and this celebrity is one of them. The settings for some of his projects have been the West, the East, and the South… but not in exactly the way you may be thinking. And you should pay no attention to the back of the head of the woman next to him. Need more clues? Sorry, but we’ve already given you five of them! [Optional] Better hairy or clean-shaven? The O. C. is west, Gotham is east, southland is south. So close to being first with an answer! That’s what I thought but the clues seem to indicate this Ben McKenzie. I feel like it’s Daniel Radcliffe for some reason. THIS^^ I immediately thought of JT when I saw the photo. I think James McAvoy but i’m not sure. Clues: East – Gotham, West – The O.C., and South – Southland. Benjamin MacKenzie from The O.C. I like him better without the beard. Looks like Benjamin McKenzie to me. West – OC, South – southland, east – umm, Gotham? Ok I’ll make a wild guess. 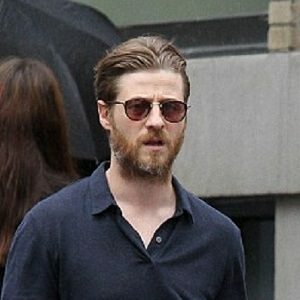 Ben mckenzie…unshaven? East, west and south wing of hospital. Kind of looks like Ben Mackenzie to me. The OC, Gotham, Southland. Looks like Ed Norton, and that beard is scraggly man- get rid of it! Oh geeez I’m guessing here – Justin Timberlake? Looks like Edward Norton to me.